This PDF 1.7 document has been generated by PDFium, and has been sent on pdf-archive.com on 23/05/2016 at 04:37, from IP address 182.173.x.x. The current document download page has been viewed 173 times. File size: 314 KB (24 pages). http://dx.doi.org/10.1590/1678-69712015/administracao.v16n1p213-235. Submissão: 4 mar. 2013. Aceitação: 14 out. 2014. Sistema de avaliação: às cegas dupla (double blind review). UNIVERSIDADE PRESBITERIANA MACKENZIE. Silvio Popadiuk (Ed. ), Alexandre de Almeida Faria (Ed. Seção), p. 213-235.
da Universidade de São Paulo (Esalq-USP). da Universidade Federal de São Carlos (CCGT-UFSCar). em Gestão e Tecnologia da Universidade Federal de São Carlos (CCGT-UFSCar). e Tecnologia da Universidade Federal de São Carlos (CCGT-UFSCar). The importance of efficient logistics for trade growth is widely acknowledged. represents a challenge to logistic operations in transporting and storing products. and multiple comparison tests of means have been applied to analyze the data. and importers worldwide (Germany, U.S.A., Japan and the Netherlands). Furthermore, they are the strongest competitors of Brazil in international trade. International trade. Logistic performance indexes. Cluster analysis. Logistic. third party logistics (Korinek &amp; Sourdin, 2011; World Trade Organization, 2012). diversification, ability to attract foreign direct investments, and economic growth. position in international trade (Faria, Souza, &amp; Vieira, 2011). 1.2%. Brazil stands out as the nineth global economy but it is on the twentysecond position on the exporters ranking. is a lack of logistic collaboration to provide more integration among the transaction process (Vieira, Yoshizaki, &amp; Lee, 2009). Djankov, Freund, &amp; Pham, 2006; Portugal-Perez &amp; Wilson, 2010). 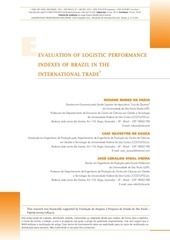 (LPI) which has been produced by the World Bank to analyse the Brazilian logistics performance regarding to its main competitors in the international trade. What are the top logistics performers in the international market? address their public policies, and also to highlight the logistic obstacles of Brazil. which have been applied. Section 4 shows the main results and section 5 concludes the paper. system as summarized in Chart 1.
and agility of the process of moving the goods. It can be divided into direct and induced costs. costs and may become trade barriers. 2006; Mirza, 2008, Limão &amp; Venables, 2001; Portugal-Perez &amp; Wilson, 2010). traditional trade barriers in developing countries (Francois &amp; Manchin, 2007). tracking and tracing and timeliness (World Bank, 2007, 2010). Brazil and its main partners. to the increasing demand for physical structure especially in low income countries. of physical inspection among others are used to compare countries. are able to satisfy the customers and provide services at a reduced cost. Who are the most important buyers (partners) of Brazil? Which are the main products that these countries (partners) buy from Brazil? Which countries also sell these products to the partners of Brazil? identified the top 5 products which have been bought by each partner from Brazil. therefore they stand for the direct competitors. variables provided by the World Bank (2007) to measure logistic performance. Chart 2 shows the indexes and variables and the measurement scale for each ones. This file has been shared by a user of PDF Archive. Document ID: 00374990.